How do we know if a particular post office was a Railway Sub Office? The easiest and most obvious way is if the office had a handstamp which actually had the text R.S.O. in it. However, as we noted early, a lot of RSOs were never issued with such handstamps – they just continued to use the handstamps which they had before being designated as Railway Sub Offices. How can we identify such RSOs? We can identify a number of such offices as being RSOs by their postal addresses … which itself included the text RSO. You will occasionally see a postcard addressed directly to a post office, and the address on the postcard tells us that the office is in fact an RSO. 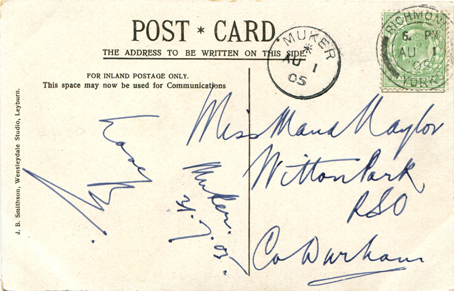 Here is an example of a postcard dated 1 August 1905, addressed to a post office, and the hand-written address tells us that the office is actually called Witton Park R.S.O. (in Co. Durham). 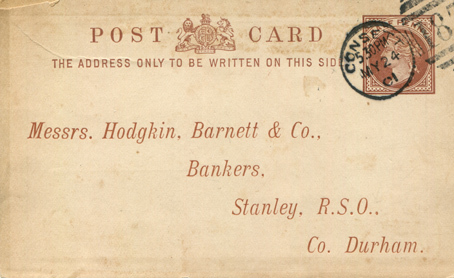 Here is another example of a postcard, this one dated 24 may 1901, and also addressed to a post office. In this case, the address is pre-printed, and tells us that the office is actually called Stanley R.S.O. (again in County Durham). The postcard example below was posted ion 12 August 1903. 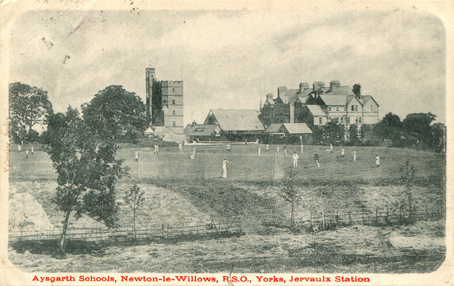 It is rather unusual, because an RSO is identified by the caption underneath the picture on the back … which identifies the office as Newton-le-Willows R.S.O., Yorks, Jervaux Station. Not surprisingly, such proof that an office was an RSO is rare! It is estimated that around 5,000 offices were deemed to be RSOs, although many were not offered dedicated RSO handstamps. In a number of cases, these offices (without RSO handstamps) can be identified as RSOs by office stationery such as Parcel Post labels, which show the full postal address of the office. 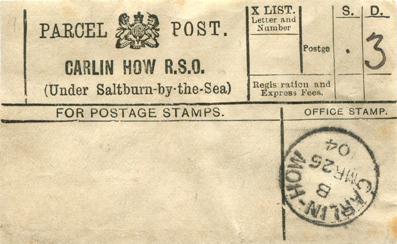 Here is an example of such a form, cancelled on 25 March 1904, where the office address on the form tells us that the office was called Carlin How R.S.O. and that it was a sub-office of (i.e. under) Saltburn-by-the-Sea. Note that the postmark on the label does not contain the text R.S.O. Of course, this method of RSO identification is not infalible. 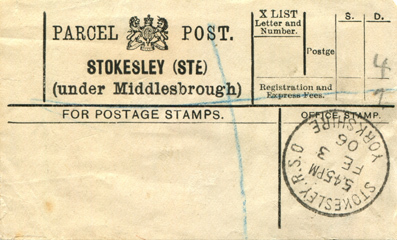 Here is an example of a Parcel Post label, cancelled on 3 February 1906, where the office address on the label tells us that the office is called Stokesley – which was actually a Railway Sub Office. However, we are saved in this case by the fact that the handstamp used to cancel the label says Stokesley R.S.O. CLICK HERE to continue to: Page 4 – RSOs Curiosities!